Is the cultural legacy of Venice under extinction? Has fast fashion won over centuries of history and tradition? Venetian masks are centuries long tradition of Venice. They have a long history of protecting their wearer's identity during promiscuous or decadent activities. Once the masks were on, all conventions and boundaries were dropped, enabling them to interact freely with other members of the society without jeopardizing their identities. The face disguises served for numerous purposes: whether it was for romantic encounters, or illicit actions, masks have always constituted an essence and a trademark of the Venetian society. Their significance goes far beyond than mere personal rendez-vous or criminal activities. They opened a world of possibilities, of interludes, secrets, scandales, and hide and seek. But most importantly, masks were a physical manifestation of Venice’s talent, its beauty, art and craftsmanship. Essentially hand-made and made to measure, they were characterized by their ornate designs, bright colors such as gold or silver and the use of complex decorations in the baroque style. They are stereotypically formed from papier-mâché and wildly decorated with fur, fabric, gems, or feathers. These bespoke works of art would transport wearers to another universe, making them forget whom they were and allowing them to be whomever they wanted. That was the magic of the Venetian masks. Unlike the vast majority of their counterparts in contemporary European nations, each citizen in the city was part of the great economic machine of the Republic of Venice, thus enjoying a high standard of living. With a level of social wealth unequaled since, the citizens of Venice developed a unique culture, in which the concealment of the identity became a paramount daily activity. However, as a result of both physical and consequently character disguise, people naturally found themselves taking advantage of the situation. The society grew decadent: women’s clothing became utterly revealing, sexual promiscuity was commonplace and acceptable, gambling went on all day and night in the streets and houses. Even the nuns and monastics of the clergy wore masks and engaged in the same acts as the majority of their fellow citizens. Rome turned a blind eye, as long as the Republic continued to make generous donations. But the Republic fell into a state of luxury, indolence, and moral decay. A decision was made to ban the wearing of masks. There was eventually a common consent that there would be an acceptance of the masks between Christmas and Shrove Tuesday. The facial disguises were therefore restricted to certain months of the year. This period became known as the famous Carnival of Venice. Very popular until nowadays, the modern celebration of the Venetian Carnival has reinvigorated the art and craft of making Venetian masks. Recognizable types of Venetian masks continue to dazzle tourists, dancers, and pageant participants during the Carnival abut also all year round. The masks have spread to Halloween masquerade balls and what North and South Americans call “Mardi Gras”. Regardless of the nature of the occasion or festivity, Venetian masks always carry their rich Italian history and reflect the city’s cultural heritage. Yet tourists seem to have substituted the artisanal masks to any cheaper ones they can find in every corner of the city. Is Venice falling into another decadence? From opulence, artisanal, craftsmanship, designs, to fast making, fake masks and cheap importations? I find myself roaming around the streets of Venice. Exaggeration aside, every ten footsteps I take – and mind you I have big footsteps - I bump into a stand that sells masks. They are all superposed with no consideration of aesthetics or presentation whatsoever. The overall montage of masks felt cheap. It’s as if it was a one-dollar shop, or a buy one get one free stand policy. You did not need to be an art connoisseur or an expert in the cultural legacy of Venice to know that these masks were far from being handcrafted and authentic. I stop at a stand filled with agglomerations of plastic look alike Venetian masks. It seemed to me like these stands of “fake” masks were betraying Venice’s legacy and throwing all these years of cultural heritage away. How did the city of art and design fall into the vicious circle of quantity VS quality? I set out to investigate the matter. I spot a stand in Piazza Del Marco with superposed masks that are practically falling off, of course. People are cueing as if it is Venice’s version of Black Friday. I ask the man in charge, Roberto Macedonia, about the reason of the density of people around his stands. “Because we are positioned at the Piazza where all tourists are. Also because they are very affordable”, he replies. I inquire about his price points. He says that masks vary from five to ten euros, depending on the size. I play the ignorant card, and ask him to explain the significance of each mask. He replies in the most concise way: “they are all inspired from the Venetian carnival”. Needless to say that anyone within the Venetian mask industry should at the very least now that many designs of Venetian masks stem from Commedia dell’arte, from full-face masks like the Bauta, to eye masks referring to the Columbina character. “It’s a win-win situation for everyone, for the tourists, for me, for the economy. Imported masks are much cheaper, and therefore are sold at a lower cost. Eventually, tourists want to buy into a memory of their trip, and nothing is more relevant to Venice than a mask”. He had a point somehow. I mean, his logic made sense. But that still doesn’t make it ethically correct to substitute centuries of legacy and culture for economical purposes and increased profits. Mulling over Roberto’s words, I walk around the area of Salizada San Provolo, and find myself on the Taddio Maria Rita street. I roam around, my eyes on the look out for something that would ignite that spark of hope in me that Venice’s legacy still lives on. I am instantly drawn to a window with beautiful setting and designs. I go in. Masks are carefully hung one by one on the walls, dolls are dressed with beautiful costumes with embroideries, and classical opera music is playing in the background propagating serene and authentic Venetian vibes. 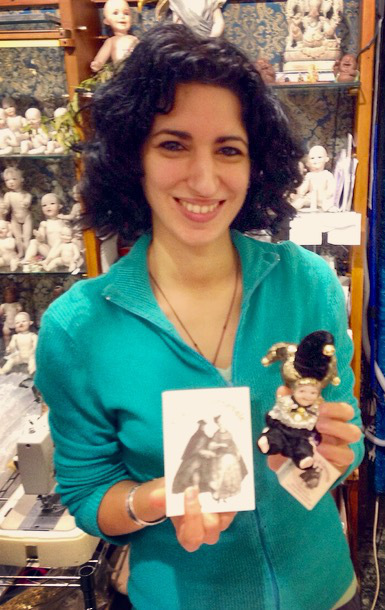 Grace Lo Porto is the owner of the artisanal shop Magie Di Carnevale. She explains to me how she is the third generation of artisans in her family. The store has been ongoing for seventeen years. Before it was located in another area, and they recently moved here. Grace emphasizes on the significance of her family’s place, as it is more than a mask shop. “The store is an illustration of our family tradition”, she states. It is also a physical manifestation of Venice’s cultural legacy that is on the verge of being extinct. Grace explains how her family’s store fills a gap in the market in the sense that there is a palpable paucity of authentic masks condensed with Venetian cultural heritage. The once handcrafted masterpieces have been replaced by cheaper inauthentic and valueless alternatives. “Everything is hand-made. In our handicraft laboratory we produce masks made of papier-mâché and ceramic, decorated with gold and leaf and colors like the typical Venetian style. We also handcraft in our workshop collectible dolls made of bisquit porcelain with dresses of velvet, damasks, and lace of high quality, costumes, capes, tabarri and tricorni hats designed on original epoch models”. She was right. It all made sense to me now. It all comes down to what people are looking for. There will always be an ongoing debate between fast fashion and craftsmanship, and imitation and authenticity. It takes a real eye that appreciates artisanal, handcrafting, and details do go the extra mile, literally, by finding an authentic shop amongst the condensed fake ones, and invest in something ever-lasting. Artisanal masks might be a bit pricey, if compared with the fake imported ones, but they are worth every penny. Whilst the imported disguises are soulless, the bespoke masterpieces embody centuries long of Venetian culture and make their wearer feel like they have been transported back in time to the old Venetian Carnival days. With every paintbrush stroke, the artisanal mask is being impregnated with a soul, history, culture, legacy, and emotions. I felt rested after I left the store, a black metal mask carefully wrapped in a bag, and my doubts erased. Venice is still the city of magic; you just have to know where the magic is hidden, and be willing to invest in it.